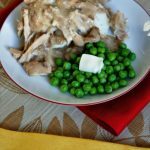 Instant Pot 3-Ingredient Chicken and Gravy–an almost embarrassingly easy recipe for a good old fashioned dinner. Serve the chicken and gravy over mashed potatoes, rice, noodles, toast or biscuits. The slow cooker version of this recipe is one of the most popular recipes on my blog. Sometimes people just want super easy recipes, I guess. Recipes so simple you just memorize them. This is one of those. It worked fabulously in the Instant Pot. We served our chicken and gravy over mashed potatoes. Our neighbor kid was over eating with us and said, “this is like Thanksgiving dinner.” It did give me flashbacks to school lunch “turkey and gravy” day…one of my favorites in elementary school. What Instant Pot Did You Use? 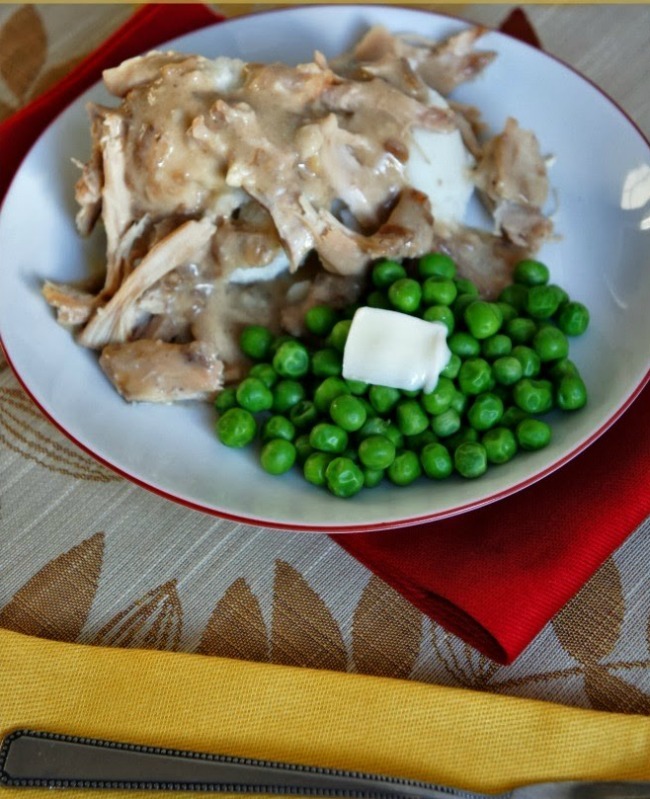 To make this Instant Pot 3-Ingredient Chicken and Gravy I used my 6 quart Instant Pot Duo 60 7 in 1 . I also own the 6 quart Instant Pot IP-LUX60 V3 Programmable Electric Pressure Cooker. They are both great pressure cookers! The first one I mentioned has a yogurt making function but other than that they are fairly similar. The price difference between the two is about $20. An almost embarrassingly easy recipe for a good old fashioned dinner. Serve the chicken and gravy over mashed potatoes, rice, noodles, toast or biscuits. Add water or broth into the Instant Pot. Add in the chicken. Sprinkle the onion soup mix on top of chicken. Dump cream of mushroom soup on top of chicken. Do not stir. Cover and make sure the valve is on “sealing.” Set the timer on manual (high pressure) for 15 minutes. When the timer beeps let the pressure release naturally for 5-10 minutes and then release the rest of the pressure by moving the valve to “venting.” Remove the lid. Use a spoon to break up the chicken. Serve chicken and gravy over potatoes, noodles, toast, biscuits or rice. *I used chicken thighs for this recipe because I prefer the dark meat. However, I believe you could make this recipe with boneless, skinless chicken breasts. I would cook for 12 minutes with chicken breasts. Thanks for stopping by! Do you love instant pot/crockpot recipes? Wish you had more good ones that your family would actually eat? Get all my new recipes delivered to your email inbox by signing up below. Could I cook rice in the pot-in-pot method with this recipe? Yes this would work wonderfully! I am a first time user. I own the crock pot pressure cooker. Are there any changes I need to make to this recipe? I’d follow the recipe as written. I’m not familiar with the crockpot pressure cooker though. It’ll probably be really close. This meal has become one of our favorites and has to be in our weekly meal rotation weekly. I serve over mashed potatoes. I see alot of comments about gettign a burn notice. I have an 8qt and use two cups of broth then add onion soup mix and then the one can of cream of mushroom soup. I do not stir until after it is done cooking. I have never received the dreaded burn notice. I remove the chicken and add a cornstarch slurry to thicken my gravy and put back in the chicken. This is one our favorites!!! My family doesn’t like mushroom soup. Can i use cream of chicken instead? Do I need to up the cooking time if I am doubling the recipe? I have a Instant Pot Duo-8.. When I make your recipes, do I have to make changes ? Most of the time the recipes will be exactly the same. The only thing you need to be careful of is having enough liquid in your pot to the come to pressure. I think you’ll need about 1 1/2 cups of liquid to come to pressure. I’m new at this my son got me a 12qt gowise and I cant find recipes for a gowise ever.how much liquid needs to be in a 12 qt pressure cooker when in use ? That is a huge pressure cooker. How many people are you cooking for? You may want to invest in something smaller. A 12 quart will be great for cooking for large groups but it will take a long time to come to pressure and it will be more cumbersome to clean up. I would think you’d need at least 2 cups to come to pressure but I’m not positive on that. Have you made this adding wheat pasta? If so will you please send me directions. First time using ip! no I haven’t! good luck with your IP you will love it. I followed the directions, added some garlic powder and poultry seasoning, and it is DELICIOUS! No problems, no “burn” signal. PERFECT! Thanks soooo much for an easy, nutritious, and delicious recipe!!!! It was really good! I made it with chicken breast (cut into chunks). I added sautéed mushrooms after the chicken was done. Served it with rice, coleslaw and green peas. 8 qt potter here! Used boneless skinless chicken tenderloins, 1 cup water, 1 packet onion soup mix, 1 can of cream of mushroom. Cooked for 10 minutes and natural released 15 (got side tracked), chicken shredded easily with a spoon. Used a tsp of cornstarch to thicken sauce and served over rice. Pretty tasty! This was only my 2nd meal attempt, I’ll be using this one again! Thanks for sharing. I’m glad you liked it! Welcome to the Instant Pot world! Do you know what the carb count is? This was so good and easy. I used only 2 chicken breasts, so cooked for 9 minutes and it came out perfectly. Thanks so much! Hello, First of all I love your recipes. I tried a lot of them and they are all amazing. I do have a questions though. I noticed that a few people commented that they got the “burn” notice. Would that be because of the size pot they are using? I have the 8 quart and saw somewhere that you need a minimum of 2 cups of water instead of one cup for the six quart? Do you know if this is true? If you have an 8 quart you might want to consider adding more broth to this recipe. It definitely wouldn’t hurt! Could you also add vegetables in the beginning to cook with the chicken? You could probably add in some baby carrots and perhaps some potatoes but other vegetables like asparagus or green beans would get too mushy. You may want to cook the vegetables using the pot in pot method. Add a bit of water to the pan, add in the veggies and cover the pan. Place it on top of the chicken and the vegetables will sort of steam while the chicken cooks. I can’t wait to try this in my Instant Pot. If I add cut potatoes, do I need to increase water or time? no you don’t need to cut the water. Are you making mashed potatoes out of them. If so the 15 minutes should be fine. If you just want potato chunks the potatoes will be really soft. This turned out really good I gave it a 4 b/c I made some changes to it. I used boneless skinless chicken breast, added poultry seasoning, a bullion cube, and 1-1/2c of chicken stock. My family loved it excited for leftovers. This recipe was so easy and delicious! It was my first time using the instant pot so I wanted to try something easy. This did not disappoint! I will definitely be making again! Oh I’m so glad you liked it! This is perfect for a beginner. Using a 6 qt IP Ultra. Sadly I am in the “burn signal” camp. I added another 1/2 cup of chicken broth. In the end I added a cornstarch slurry to thicken and some pepper. Served over noodles with mixed veggies and roll on the side. Condensed soup? If using condensed do you add water or leave out? I used 2 cans of condensed mushroom soup and frozen chicken breasts and for the burn signal. So glad to hear this Linda! I’m giving this five stars because it is a great base recipe and the instructions are great as well. I used around 1 1/2 to 2lbs of chicken, half thawed in the microwave. After reading the comments, I decided to put the water in first, followed by the chicken and then I used one can of cream of chicken and one can of cream of mushroom. No onion mix. I let it natural release for about 10 minutes and shredded the chicken in a plate and added it back to the sauce. Served over rice and it was great! I just saw this on Pinterest, and seriously my first thoughts were about those school lunches. They were my favorite days too; with the ice cream scoop of mashed potatoes. Drool! Does it taste like it?? haha! yes it does taste like it! Can I use bone-in chicken breasts? How long would I cook? yes that would work great. Keep the same cooking time. That is shocking! Did it reach pressure? I followed the directions exactly and the instapot kept registering “burn”. What am I doing wrong? I’m sorry! Did you figure it out. Maybe add in a 1/2 cup of chicken broth. Mine is doing the same thing. I don’t want to water down the gravy, so next time will be doing just water and onion soup, then stirring in the soup at the end along with the chopped up chicken. also worked amazing for me with Pork Chops!!! I would like to try this recipe but I like thicker gravy and am concerned about the water. Could I just use two cans of soup instead? What would you suggest for time with frozen chicken breasts? First timer here! Just do 15 minutes…the pot might take longer to come to pressure but it will work out marvelously. How much longer Do We cook if the chicken is frozen? cook the same amount of time. The pot will just take longer to come to pressure. Any problems using cream of mushroom soup in instant pot under pressure? How would you adjust the time for bone-in thighs? Add 1 hour to the cooking time! How many chicken breasts would I use? I love your recipes. Any chance there will be an instant pot cookbook? And do you have other crockpot cookbooks? About 2 pounds of chicken.